Complicated processing systems can be easily negotiated and reflected in Sequence diagrams, by adding activation layers on a single lifeline. A Class invokes the method Sample A, which in turn calls Sample A1. In the Diagram Toolbox, select 'More tools | Interaction'. 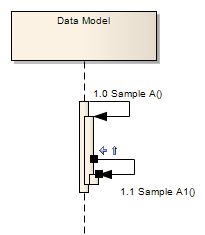 Click on the 'Self-message' icon in the 'Interaction Relationships' panel. 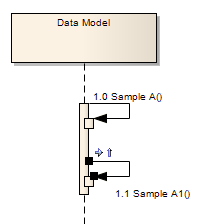 In order to raise the Activation level of Sample A1, click on the raise arrow of the selected connector. The lifeline now visually depicts that method Sample A1 is called during the processing of Sample A. In this example, a few more self-messages have been added. 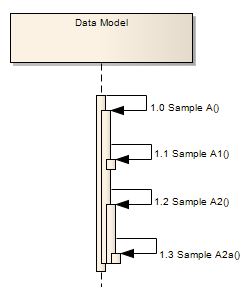 The message Sample A2a is called from Sample A2, which in turn is called from Sample A (not Sample A1). Sample A1 is called from Sample A.